If your freezer piled up blocks of ice, it's time to thaw. After all the frost not only looks messy and eats up space, it also impairs the performance of the kitchen appliance, forced now to consume more electricity. Does not play a role whether you are going to thaw a large freezer camera or a regular freezer compartment in the fridge. And in that and in other case you will have to act on the same principle. Disconnect your appliance from the power supply, remove all of the products, put them somewhere where they will not be able to quickly thaw. Re-freezing will not benefit neither them, nor you, nor the freezer. Prepare dishes in which you will collect melt water. You can just leave it as it is. The most in a day, freezer thawed itself, provided that you leave the door open. But this should be used only in the case if you're not in a hurry and products requiring freezing, you do not. Most people try to speed up the process. In any case, not salivate the ice with a knife or other sharp objects, so you can easily damage the wall of the chamber, after which the device will remain only be sent to landfill. Also, do not blow on the ice with hot air jet from a hair dryer. 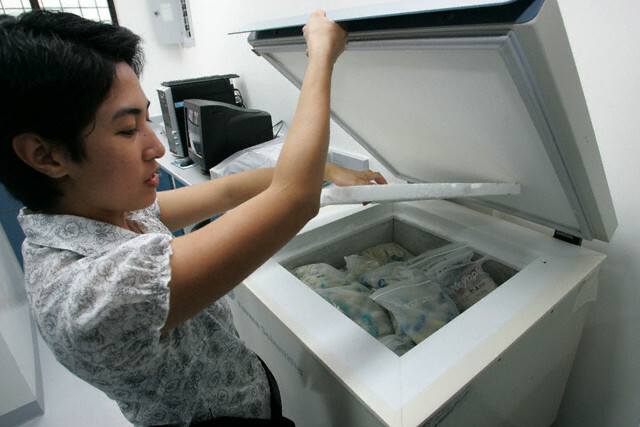 A sharp temperature drop acting on the walls of the freezer may cause the formation of cracks and breaks. The best thing you can do is to provide the outflow of cold air from the interior space of the device. The easiest way to do this using a fan, a Hairdryer can also play a positive role if it has the function of supplying cold air jet. A great helper when defrosting the freezer can be a normal salt. Just try it on the ice, and he starts to literally melt before your eyes. Do not forget to continuously remove the formed water. After thawing, wipe the camera with a cloth soaked in the vinegar solution, dry thoroughly all the walls and your freezer ready to use.